Interstellar sweeps us away in the science, leaving us to drift among the stars and observe in wonder rather than understand. For this, it is utterly demanding of second and third viewings -- a Nolan trademark. Christopher Nolan describes his latest film as a "a conversation with 2001: A Space Odyssey," a movie whose influence on his own work has been profound, which he readily and happily professes. Nolan, whose previous films (Inception, Memento, The Dark Knight Trilogy) are famous for their narrative uber-complexities and dark, pounding vibrancies, brings a powerful, consuming intimacy to Interstellar, a phenomenon that has been seen only in flashes in his already iconic young career, and a phenomenon that makes Interstellar so emotionally and narratively transcendent. It's also a phenomenon that makes its comparison to one of the most revered science fiction movies of all time seem like a lot more than a self-righteous longshot. In Nolan's own words, Interstellar couldn't have been made if he'd denied the towering presence of 2001, and it shows in the best kinds of ways. Rest assured, Interstellar is wholly, mindblowingly original. If 2001 was made in a time when space travel was always on our collective conscience, Interstellar is a sort of reminder to the modern world of the wonder and significance, both seen and unseen, of space exploration. This is best exemplified as the movie's protagonist Cooper (Matthew McConaughey) muses, "We used to look up at the sky and wonder at our place in the stars, now we just look down and worry about our place in the dirt," (Matthew McConaughey -- his winning streak continues), after his 10 year old daughter Murph (Mackenzie Foy) is suspended at school for speaking out against her her textbook's suggestion that the Apollo missions were a hoax. Around them, their world, which is shown in the near future, is slowly turning into a wasteland. Dust bowl conditions plague America's farm belt, while droughts and famines are slowly knocking off the rest of the population. Murph's generation is expected to be the last one to survive. Meanwhile, Cooper's 15-year-old son Tom (Timothee Chalamet) struggles in school, his father's ailing farm presumably his only future. Nolan takes the first part of his film to paint a picture of this scorched Earth, weaving it amongst the relationship between Cooper and his children, which, explored only briefly on Earth, offers a funny and heartfelt exposition to the movie's engulfing theme of parental love. After an enormous dust storm, Cooper and Murph stumble across the coordinates of a secret NASA headquarters, where a group of scientists, led by his old professor, Dr. Brand (an outstanding Michael Caine) is doing the research for a space expedition to a far-off wormhole that could transcend all limitations of space travel. The wormhole would give them access to another galaxy of planets, each with its own conditions and environment, and each prospectively suitable for human inhabitation. Ideally, they'll get everyone on earth to an inhabitable planet before the species goes instinct. Plan B is that humanity on Earth fails and the crew of astronauts are left to repopulate a far-off planet. Recognizing the voyage's enormous significance, Cooper agrees to embark on the journey that will will take the astronauts no more than a few years, while time on Earth passes from decade to decade. Cooper leaves his children with their father in-law (John Lithgow), recognizing the expedition's grand implication that will extend far beyond his own family. He drives off teary eyed, while we get the immediate sense that neither of his children, especially Murph, will ever recover from their father's abandonment, no matter the circumstances. Cooper is accompanied on the voyage Brand's daughter, Amelia (Anne Hathaway), Romilly (David Gyasi), and Doyle (Wes Bentley), not to mention the ship's two android counterparts, CASE and TARS (voiced by Josh Stewart and Bill Irwin, respectively), loving nods to 2001's HAL, who bring unexpected comic relief. It's Interstellar's midsegment that delves deepest into the science of it all. Nolan consulted renowned physicist California Institute of Technology physicist Kip Thorne for the facts. It's likely that about 10% of viewers will catch all of the script's references to real-world theory on the first viewing -- from the theory of relativity at work to more than we thought there was possible about gravity. Nolan makes that okay. Whereas Inception had us weaving between dreams to the conclusion to its puzzle, Interstellar sweeps us away in the science, leaving us to drift among the stars and observe in wonder rather than understand. For this, it is utterly demanding of second and third viewings - a Nolan trademark. What keeps us and the movie grounded even in these densest moments is its sheer power to excite and confound. A scene where the crew's spacecraft is caught in a tsunami on one of the planets is pure cinematic gold, as is a near fatal mistake on an icy tundra, or a brush with an unknown cosmic entity, or scenes so cleanly edited that you might feel the G-force. What propels the movie into its third act is what amounts to a twenty-three year leap in time on Earth (it amounts to two in space, but remember: time is relative), one of the movie's most brilliant narrative curves. We again see Murph, near forty, now played by Jessica Chastain, and Tom by Casey Affleck, struggling in very different ways with the fast-approaching end. The leap in time leads to a leap in the movie's bristling emotional intensity. A scene where Cooper watches twenty-three years worth of his children's video messages after returning to their station is a miracle of harrowing beauty, lead by McConaughey, who triumphs in every note of the movie's heartfelt purpose. McConaughey, along with the rest of the film's principal cast, deserves endless praise. Hathaway and Chastain are revelatory on the opposite end of familial dysfunction and separation, as both are left reeling from the decisions of their fathers, and Caine matches signature wisdom with the film's brainy wonder. Juggling multiple storylines that span time and space, the film is a narrative and technical marvel. Nolan's script, written with his brother Jonathan, is a fantasia of science, melodrama, and social and philosophical statements that floors us. Hoyte Van Hoytema's cinematography is breathtaking, from the cornfields of middle America to the the chute of an interstellar wormhole. Lee Smith's wonderful editing jumps from galaxy to galaxy with cohesive intensity. Hanz Zimmer, a Nolan regular, contributes a brilliant, bracing, continuous score that adds an indispensable dimension to the movie's sprawling unity. 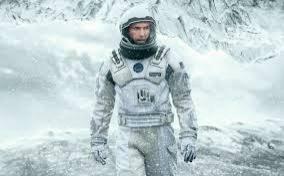 What makes Interstellar great is its ability to connect its intensely personal meditation on love with it's overwhelming cosmic grandeur. Like the past greats of its kind, it is both an epic pondering of our universe and a pondering of the definitions of humanity, love, and what it all means. In the end, it only feels altogether fitting to place it in the ranks of Kubrick's 2001, or Tarkovsky's Solaris, not only because Nolan had the guts to shoot for the literal and figurative stars, but because he damn well reaches them. Interstellar is an update on the power of science fiction -- a movie that dares to go far beyond sci-fi banality and give us something profoundly important, universal, and poignant to chew on. It's doubtlessly one of the year's best movies, and it's a science fiction landmark.